If you place your right hand over the area under the ribs on the right side of your body it will just about cover the area of your liver. The liver is the largest gland, and the largest solid organ in the body, weighing some 1.8 kg in men and 1.3 kg in women. It holds approximately 13% (about one pint or 0.57 litres) of your total blood supply at any given time and has over 500 functions. The liver is dark reddish brown in colour and is divided into two main lobes (the larger right and the smaller left) which are further subdivided into approximately 100,000 small lobes, or lobules. About 60% of the liver is made up of liver cells called hepatocytes which absorb nutrients and detoxify and remove harmful substances from the blood. A hepatocyte has an average lifespan of 150 days. There are approximately 202,000 in every milligram of your liver tissue. 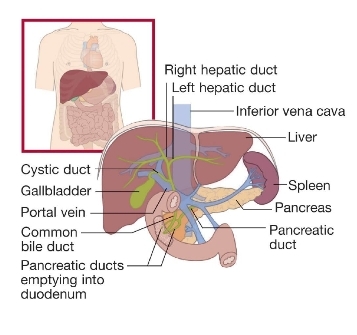 The liver receives its blood supply via the hepatic artery and portal vein. One of the liver’s most important functions is to break down food and convert it into energy. Carbohydrates, such as bread and potatoes, are broken down to glucose and stored mainly in the liver and muscles as glycogen. When energy is required in an emergency the liver rapidly converts its store of glycogen back into glucose ready for use. Your liver also helps the body to get rid of waste. Waste products which are not excreted by your kidneys are removed from the blood by the liver. Some of them pass into the duodenum and then into the bowel via the bile ducts. People with liver damage may sometimes lose the ability to control glucose concentration in the blood and need a regular supply of sugar. Your liver plays a vital role in fighting infections, particularly infections arising in the bowel. It does this by mobilising part of your body’s defence mechanism called the macrophage system. The liver contains over half of the body’s supply of macrophages, known as Kuppfer cells, which literally destroy any bacteria that they come into contact with. If the liver is damaged in any way its ability to fight infections is impaired. Symptoms of liver damage can be difficult to spot as they are not always obvious - they can include tiredness, nausea and itching. NHS choices website has information about the signs, symptoms and causes of liver disease.